Powered by Microsoft Windows, Ford's voice-activated SYNC(r) in-car connectivity system takes the integration of mobile devices, voice control and convenience to a new level with extensive device compatibility and voice command. The system features Ford's Emergency Assistance which alerts local emergency services operators after an accident, and in the correct language for the region. It's the most advanced system of its type and available in more than 30 countries across Europe and beyond. The activation of an airbag or the vehicle's emergency fuel pump shut-off prompts the vehicle to initiate an emergency call, using an introductory message, through the occupant's Bluetooth connected mobile phone. The message is transmitted in the appropriate local language based on the GPS coordinates of the vehicle. 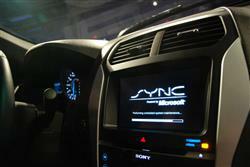 SYNC(r) can also read aloud incoming SMS text messages from compatible mobile phones. It works with a variety of digital music players, including iPod and USB flash drives. The system automatically updates phonebook entries, while audio files can be browsed by genre, artist, album, song and playlist using simple voice commands. The USB port also enables the implementation of software upgrades for future enhancements and features. Developed in association with speech technology specialist Nuance, SYNC(r) initially supports UK English, EU French, EU Spanish, EU Portuguese, German, Italian, Turkish, Dutch and Russian. SYNC(r) and Emergency Assistance are just two highlights of the excellent technology package now available across much of the Ford range. It will also include Ford's Active City Stop system designed to help motorists avoid low speed collisions with stationary or slower-moving traffic in front. Hill Start Assist is also included. Incorporating a Rear View Camera, this useful feature helps to keep the car from rolling backwards after the driver has come to a stop on a slope or hill. SYNC(r) incorporates a radio/CD player with DAB, 3.5" dot-matrix display, extended integrated control panel, Ford SYNC(r) (Bluetooth(r) hands-free phone with Voice Control System and Ford Emergency Assistance, USB connectivity port with iPod(r) functionality, external AUX connection for external music devices, remote audio controls and six speakers, four in the front and two in the rear of the car.